Chuhak & Tecson, P.C. is proud to announce the establishment of the Joseph A. Tecson Scholarship Fund, available beginning with the fall 2017 semester for first-year law students admitted to DePaul University College of Law. The scholarship will be administered by DePaul and is open to any first-year law student both in good academic standing and with proven financial need, with a preference for those who have performed community service. It will provide support to one student each year with books and supplies and is renewable for those students who remain in good academic standing. Each year, a new first-year student will be awarded a scholarship. Deadlines for applications are on a rolling basis. Joseph Tecson was a ground-breaking attorney in Chicago’s legal community and practiced for over 50 years. In 1987 he became a founding principal of Chuhak & Tecson, leading the firm’s governmental and healthcare practices. The 11-attorney firm he co-founded 30 years ago now boasts over 65 attorneys and more than 75 staff members and paraprofessionals. Each day the firm continues to adhere to the decorum Tecson instilled in the firm three decades ago—integrity, hard work, quality, community service, civility toward one another and, equally important, a sense of humor. Tecson was passionate about public and community service. He served as a delegate with the Constitutional Convention which drafted a new constitution for Illinois in 1970 that is still in effect. Beginning in 1976 he also served for five years as the first Asian-American commissioner on the Cook County Board and was on the committee that oversaw Cook County Hospital. Chuhak & Tecson continues Tecson’s commitment to diversity today with an environment where each person is included, listened to and supported as they strive to achieve their personal best. Tecson’s zest for public service further extended to serving on the boards of MacNeal Hospital and Brookfield Zoo. He was one of the greatest proponents of the zoo’s continual upgrades and addition of new exhibits. 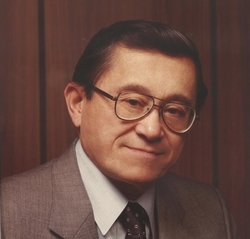 Tecson was dedicated to expanding public transportation and was the initial chair of the board of the Regional Transportation Authority, then subsequently served on the Metra Board. Further, he was frequently called upon to serve as special counsel to government agencies, including the Department of Public Aid, the Illinois Department of Insurance and the Medical Disciplinary Board. Tecson was also the municipal attorney for the Village of North Riverside. Each scholarship recipient will be invited to attend firm events and apply to the firm’s law clerk program. For more information or to learn how to apply for the Joseph A. Tecson Scholarship Fund, contact Michael Burns, associate dean for student affairs at DePaul University College of Law, at 312-362-6831 or mburns@depaul.edu.